America, the richest country in the world, stunts the growth of its population thanks to it’s adherence to a rapacious, uncaring economic system. There’s no money for socialist welfare or healthcare systems like we enjoy in Britain (and that Blair and New Labour want to dismantle). Of course, there’s always money for war. No problem there, killing kids in Iraq is a much more important task than feeding the hungry in America. That would be COMMUNISM! 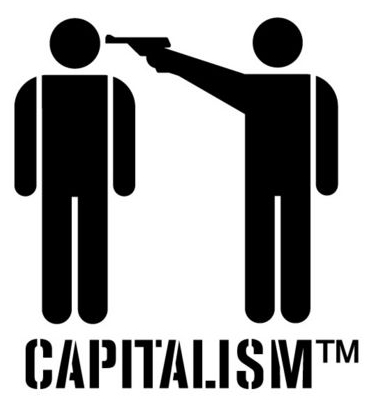 I regularly have arguments with people I meet who claim to be pro-capitalism. These are average, ordinary middle and working-class Britons. None of them are Rupert Murdoch or George Dubya. And yet, they’ve swallowed the big lies of capitalism whole. I point out to these people that everything they have, their salary, the car, the house, the paid holiday, the education for their kids, their GP, the stay they had in hospital, all of it, is based on rights won for them by the collective actions of previous generations. Capitalism never lifted a finger to clothe or house them: union power did that. Capitalism doesn’t care if their child starves or breaks a leg climbing a tree. The Welfare State does. By definition, the only thing capitalism cares about is profit. So, the next time you hear some Daily Mail-type banging on about Nanny State this, benefit fraud that, ask them who paid for the midwife that helped birth them, who paid for their education, who provided a welfare and healthcare system around them, a safety net? It wasn’t capitalism. Whereas in the US, some 15 percent of the population has no health insurance and those on welfare can barely get by, almost all citizens of northern and western European countries enjoy universal health care and a generous social net. The result is that even those children dependent on welfare in Europe have a sufficient living standard, the researchers concluded. None of this was given to us. We enjoy rights and benefits that men and women fought and died to win for us, both against capitalism and it’s uglier brother, fascism. Every minute of sick pay, every second in an NHS hospital was won through that collective struggle. Look at America and learn why we must never let those prizes be ripped from us.